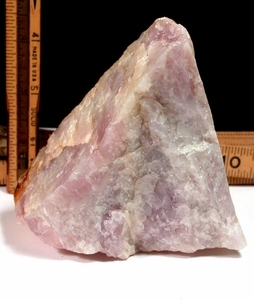 This is lithium-included rose quartz, rare and from a long-closed California mine. It sits up on any of its' edges at 2-1/2x 4x 4-1/4" to broadcast its' special brand of yin/yang with some iron oxide for grounding. Rich medium slightly translucent with areas of peachy chatoyance, keep from direct sun to preserve its' coloring.